Tinytag Transit 2 (TG-4080) and Tinytag View 2 (TV-4020) are now BS EN12830 compliant, making temperature data logging in transport within EU guidelines more affordable. Since January 2006, all measurement devices used for monitoring quick-frozen foodstuffs (QFF) require compliance with EU regulations. Food operators are also required to keep verification records of the compliance of their logging technology. The Transit 2 (TG-4080) is the lowest-cost Tinytag data logger. It is robust, lightweight and the new EU compliance makes it ideal for temperature monitoring of the transport, storage and distribution of chilled, frozen, deep and quick-frozen foods. 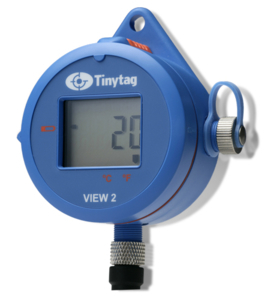 Tinytag View 2 (TV-4020) records and displays temperatures where a fast response time is needed or the place that needs to be monitored is inaccessible. The logger is also BS EN12830 compliant for use in the transport, storage and distribution of chilled and frozen foods. To become accredited, the units were required to go through various validity tests, which verified all of the claims made about the logger. An independent report was satisfied that all of the conditions have been met. The TV-4020 is now BS EN12830 compliant.